I hope everyone had a wonderful holiday! 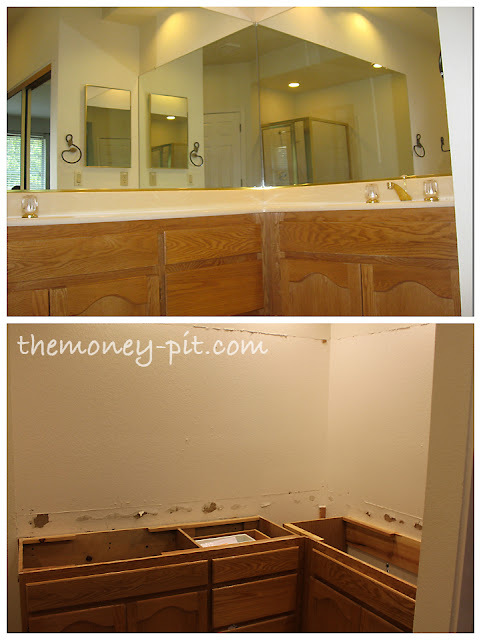 I have been on a small blogging/DIY hiatus, but thought it was time to give you an update on the progress in the bathroom. Since the tilling is finished (HURRAY!) 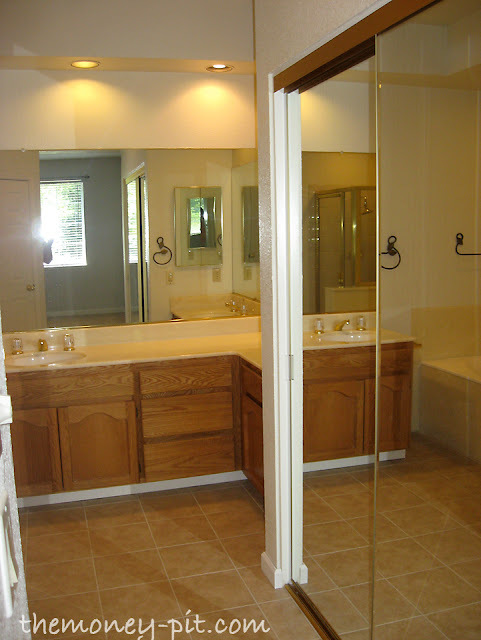 it is time to get away from the shower/tub and move onto the vanity. That means once again, it is DEMO time! 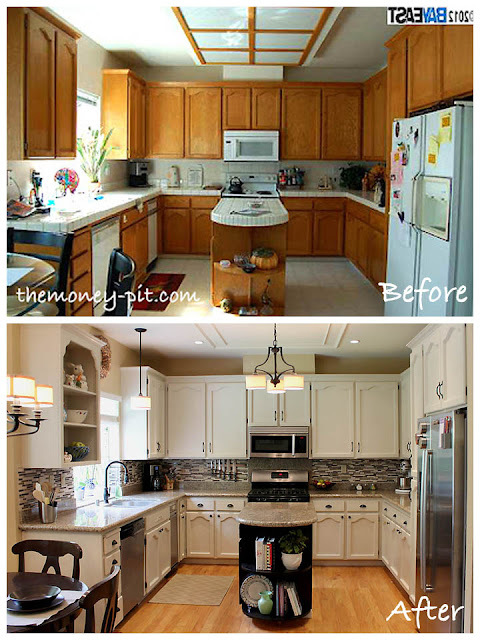 I hate it ALL, but unfortunately the budget doesn't allow me to get new cabinets. On a bright note, you have seen how pretty these EXACT awful cabinets can be when painted/stained in the rest of the house. So once again, I will be tackling another cabinet painting/staining project. 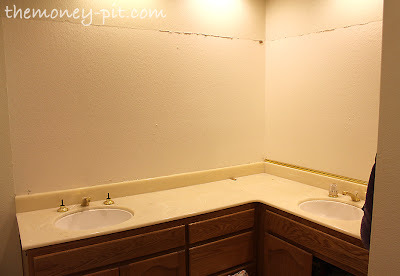 After the mirrors were down (and the room no longer felt like a funhouse) I was able to pry the countertops off. This was actually pretty easy since they weren't really attached to the cabinets. The weight of them (along with a thin line of caulk at the wall) was all that was holding them down. The last thing I did was pull out the old medicine cabinet. 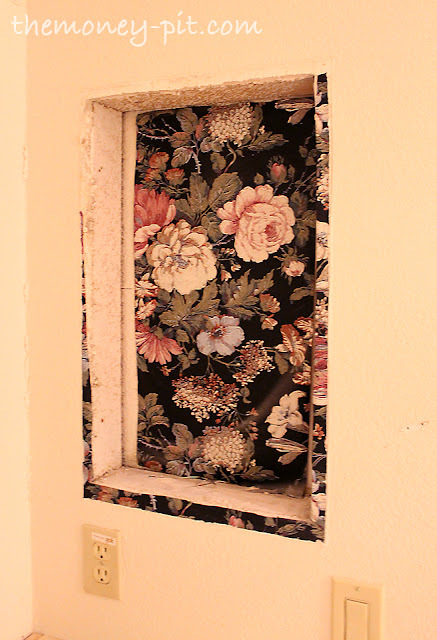 I discovered some interesting wallpaper behind it. Hmm.. I think I had a dress made of fabric that looked *just* like that back in 1992! Pretty dontcha think? Well.. anything has to be better than what I am starting with! I love demo it is such a stress releaver. 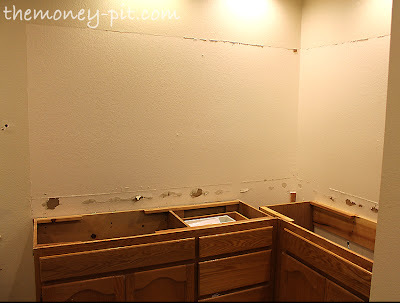 I can't wait to see what finish you are picking for the cabinets, I have honey colored oak in some of my rooms and I am thinking about changing them. I also chose the crema marble but I am not real thrilled with durability. 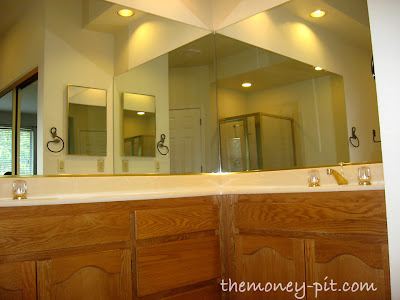 We have granite in the kitchen and hall bath and they are fabulous but the marble is pretty delicate. Things like mouth wash or glass cleaner have left a mark on the finish. I wouldn't pick it again so it might be worth asking about. 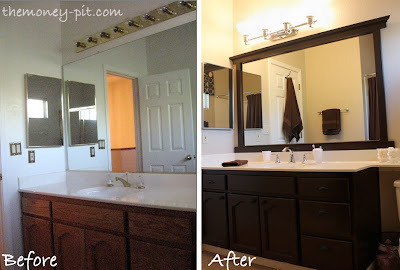 I have all of the bathroom remodel on my blog if you want to check it out. Three Dogs At Home. My friend just did that quartz composite that comes in slabs like granite but it does not stain, requires no sealing, leaves no water marks and she just had it put in all three bathrooms and laundry and sink area. Oh. It's naturally anti microbial as well! Have you considered this? The choices are so varied. Have you heard of Sarah Richardson? She is a designer from Canada and has a youtube series where she re-does a whole house using only big box store materials..it's awesome and you should totally check it out..she did a bathroom with marble and travertine as well. Marble for the counters, Love it! Wishing you and your family the best for 2013!